AV Voice Changer Diamond 6 0 10 h33t dinguskull Torrent Downloads - download free torrents! in voice changing technology. Advanced from the previous editions, Diamond Edition employs a Voice Comparator, advanced voice changing algorithms such as Frequency Morpher, Voice Equalizer, Root Formant Mover, Robot Voice, Limiter, and Noise Reduction. · Improved Voice morpher algorithm. 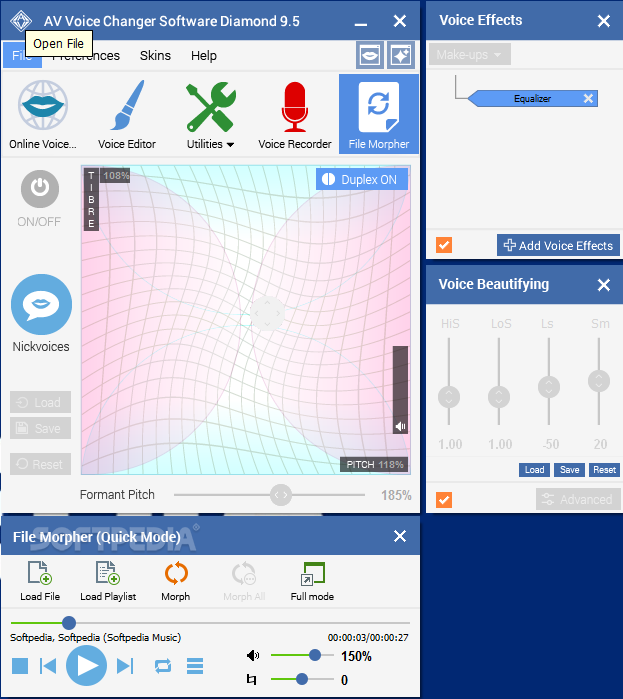 · New nice-looking 3D skin with a simplified interface and a new plugin architecture. · More easy-to-use Voice Morpher graph. · "Reset" buttons to clear all the settings and the possibility to turn off any module. · Much more ready-to-use effects and nickvoices are available. · AV VCS 5.0 DIAMOND has a built-in Voice Comparator module - so now you can morph your voice into the voices of famous artists and singers. · AV VCS 5.0 DIAMOND has Voice Equalizer and Sound Quality processors - that means more voice morphing possibilities now. · Now you may set and apply the Nickvoice rules - regulations concerning the use of the nickvoices along with other applications. *Note I have also included a skin because I do not like the look of the default skin.